Kirk is back from his holidays and had tons for me to catch up on and a few new titles to explore this week at West End Comics! He also had two more Orphan Black Funko figures for me, Cosima and Sarah have joined Helena and Alison…. just waiting on the double dose of Rachel. 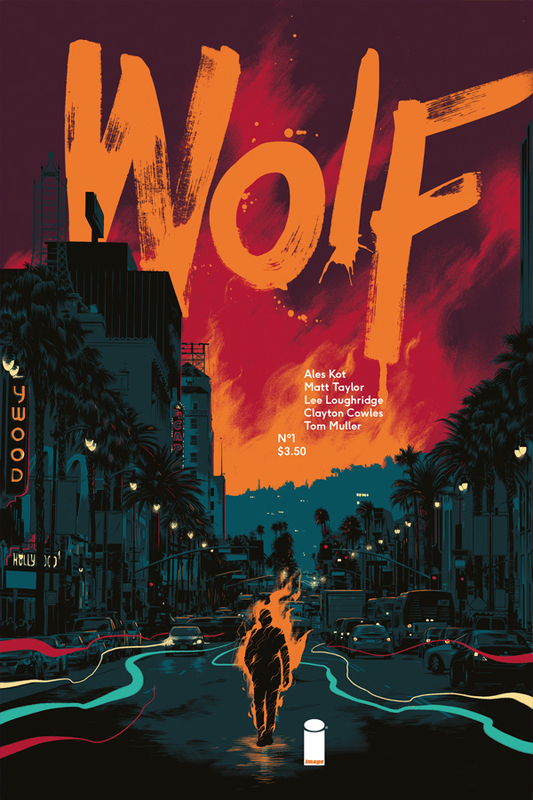 Wolf (Image Comics) issue 1, written by Ales Kot, art by Matt Taylor, colors by Lee Louhridge, and letters by Clayton Cowles. A paranormal investigator in LA, Antoine Wolfe, and an impending apocalypse. Sold. I’m not sure on the art yet, but the first issue is delightfully massive, introducing us to the not quite immortal, but awfully close, who can hear and see the dead, p.i. and ex-military, Wolfe, his chtulu inspired buddy, Freddy Chtonic, his client, a terrible, murderous man, Sterling Gibson, who may be able to help Antoine with a family affair, and a young teenage girl (with the best name reveal I’ve read, in a long time) orphaned in the bloodiest way who is interacting with someone nobody can see. Oh, and there’s a serial killer. 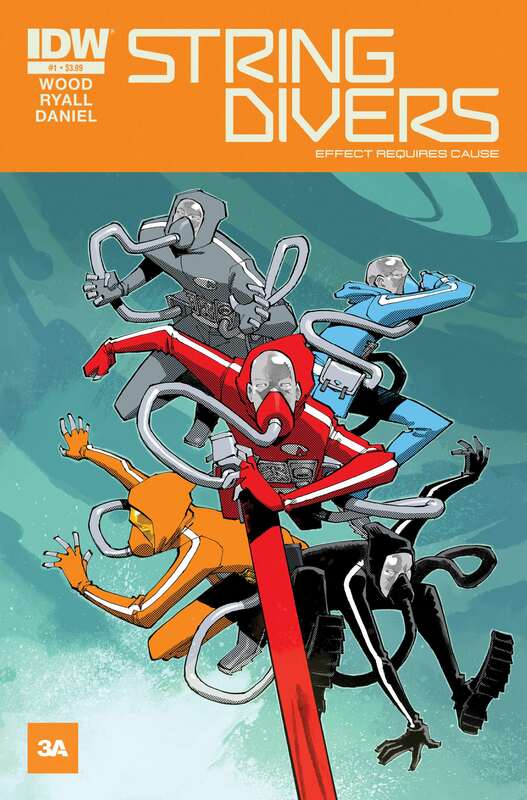 String Divers: Effect Requires Cause (IDW) issue 1, created, and art, by Ashley Wood, script by Chris Ryall and Nelson Daniel, and letters by Neil Uyetake. Filled with a playful humor the story centers on 5 characters, referred to by their uniform color, each with their own specialty, tactics, stealth, science, assassin, and fighter, that can travel down to the quantum level, and defend us against threats to reality. They are controlled by a group of multi-national scientists operating out of Switzerland, as the first and smallest line of defense against threats we can’t see with the naked eye. I liked this one a lot, except that it was over way too quick, and very curious to see where it goes. There’s a nice combination of science with exploration, and a nice sense of fun with the way the scientists, and the divers themselves, interact. 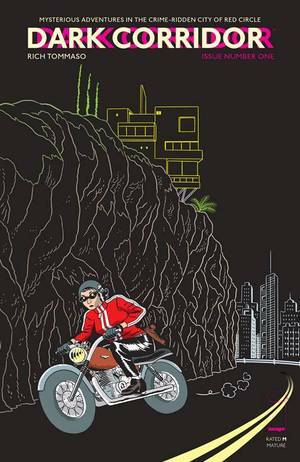 Up next is Dark Corridor (Image Comics), issue 1, written and illustrated by Rich Tommaso. 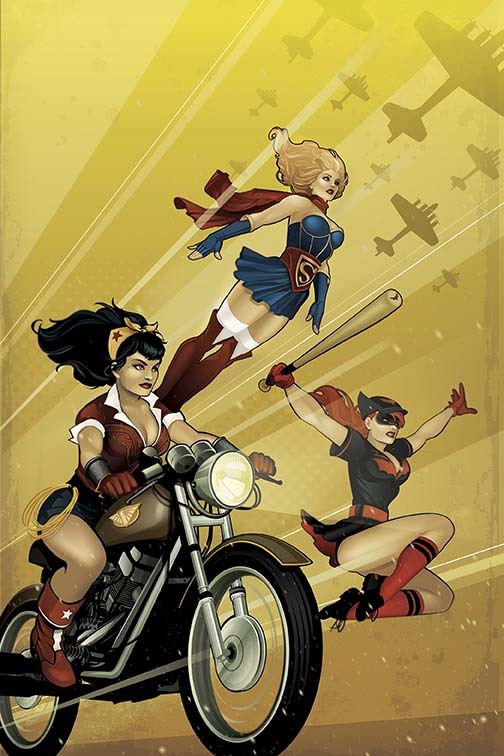 The art has a 1940s quality to it, and the stories feature a number of bad people doing a number of bad things. In this issue there are two stories, and they seemed to be tired together by a group known as the 7 Deadly Daughters. The only thing that bothers me about this nook is that there are no redeeming characters at all. They are all bad to some degree, cops on the take, murderers, assassins, and just mean dudes. That makes it hard for me to relate to the story, no matter how interesting it may be, so I’m a little divided on this one. I’m keen to learn a little bit more about the Daughters, but not sure I’m going to journey much further down this dark road, no matter how enjoyably drawn it is. 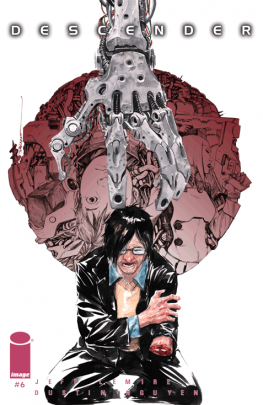 Descender (Image Comics) issue 6, written by Jeff Lemire, art by Dustin Nguyen, and letters as well design by Steve Wands. 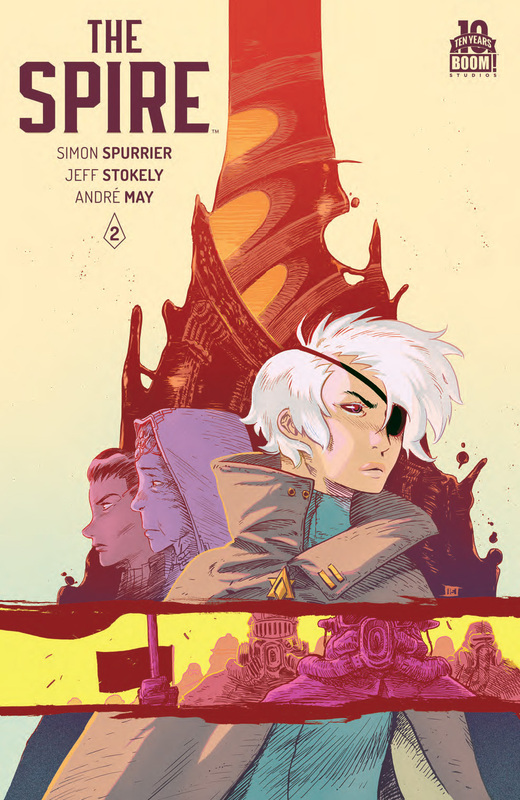 The Spire (Boom Comics) issue 2, written by Simon Spurrier, art by Jeff Stokely, colors by Andre May and letters by Steve Wands. As the coronation of the Spire’s new baroness comes closer, the skews out in the Nothinglands draw closer to the city to pay their respects, but by issue’s end see something that poses a threat to all living souls not aligned with the god-fearing Zoarim. We also learn that Sha’s lover is in fact the youngest member of the Royal Family, and her appearance makes for an uncomfortable moment for the sculpted investigator. This one continues to intrigue me, and feels like a slow burn as opposed to the hook me right away kind of story. Orphan Black (IDW) issue 5, written by Graeme Manson, John Fawcett and Jody Houser, art by Alan Quah and Wayne Nichols, colors by Chris Fenoglio and letters by Neil Uyetake. This time around, as the cover indicates, we spend some time with Rachel, and get more of her back story, and there is lots going on… we see her interactions with her ‘parents’ Ethan and Susan, as well as Aldous when she was a child. We also learn she encounters another clone, Veera Suominen, who was burned horribly in the fire that claimed Ethan and Susan, and who, in 2001, had her hand in the Helsinki Protocol, and may be out there even now, a clone yet to be revealed on-screen. 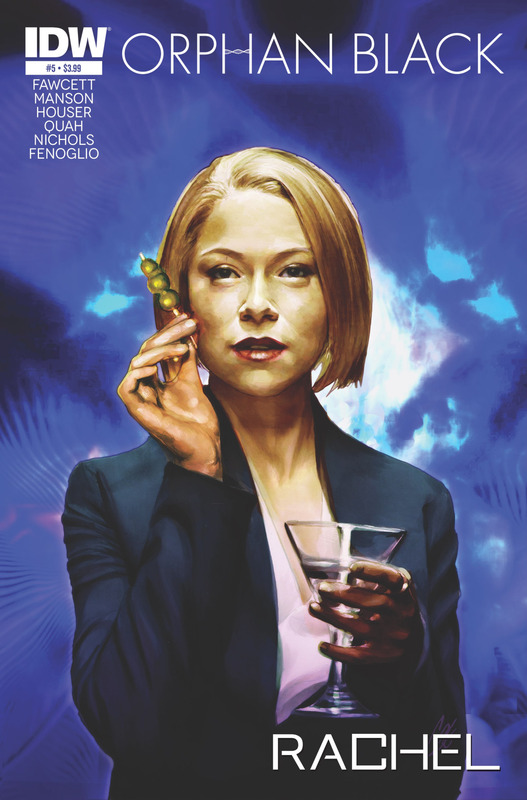 But we’ll have to wait until November, when the story continues in Orphan Black: Helsinki… CANNOT WAIT!! 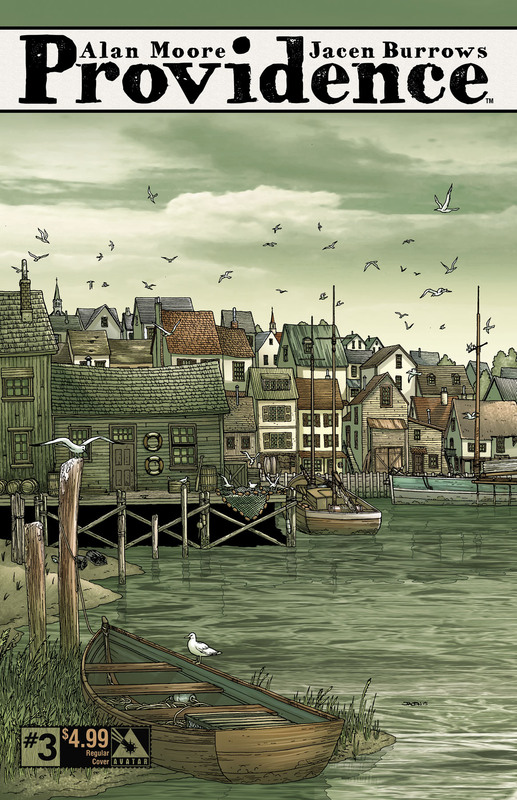 Providence (Avatar Comics) issue 3, story by Alan Moore, art by Jacen Burrows, colors by Juan Rodriguez and letters by Kurt Hathaway. Robert leaves the city, working on tracking the book, and I have to mention the fellow working the desk at the hotel, I thought Lovecraft and Innsmouth. In fact the entire town, rings of Lovecraft, with talk of island people, turns of phrase, and image there is, pardon the pun, something fishy going on in this village. There are troubling dreams, and a final bus trip to a tiny village named Athol, and he witnesses a shoaling of ‘seals.’ Creepiness abounds. Star Trek (IDW) issue 48, written by Mike Johnson, art by Tony Shasteen, colors by Davide Mastrolonardo, and letters by Neil Uyetake. Part 1 of a 2 part story entitled Deity. 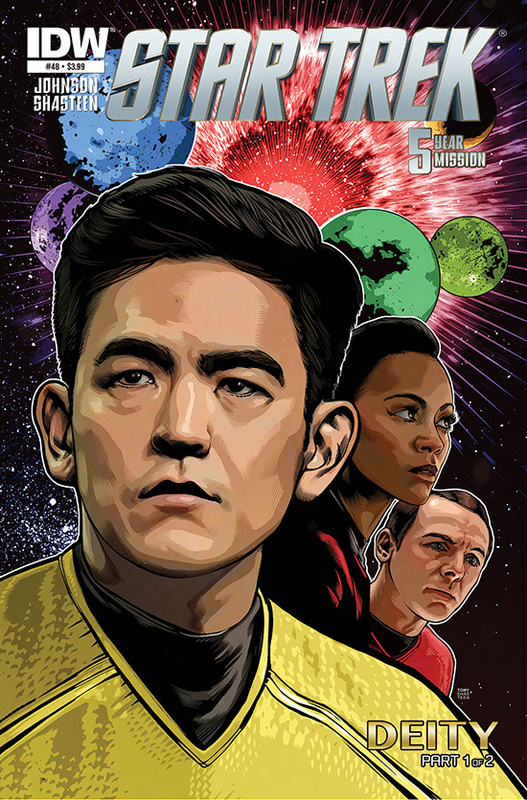 As the 5 year mission continues, Sulu is given command of his first away team to a planet in the Banks-216 system. He chooses his team, is outfitted, including a holographic blind created by Scotty and off he goes. They observe an avian-like species conducting a ceremony at a strange structure, while in orbit, Kirk and company see the arrival of a large crescent-shaped craft, similar to drawings Sulu and his team found on the planet. 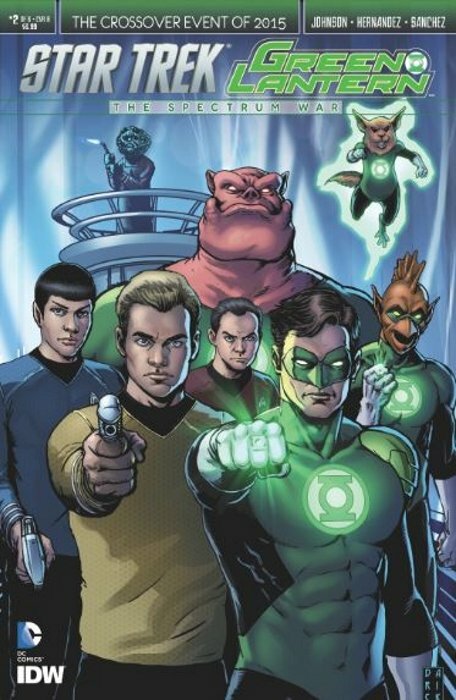 Star Trek/Green Lantern: The Spectrum War (DC Comics/IDW) issue 2, written by Mike Johnson, art by Angel Hernandez, colors by Alejandro Sanchez and letters by Neil Uyetake. Hal Jordan and James T. Kirk have their hands full as the Klingon, Chang has been chosen as the bearer of the new yellow ring, while Chekov is blue, and Uhura is indigo. Meanwhile, a Gorn, Glocon has been chosen for red, and a Romulan, Decius, a member of the senate, has been selected for orange. McCoy is given one as well! But while Chang is cementing his power on Qo’Nos, a new face appears in the Empire, the yellow-ring bearer, Sinestro. This issue was definitely more set-up than anything else, showing us where the rings are, but I’m loving the art, that seems to be faithful to both creations, and it looks like this is going to be a lot of fun! Star Wars: Darth Vader (Marvel comics) issue 8, written by Kieron Gillen, art by Salvador Larroca, colors by Edgar Delgado, and letters by Joe Caramagna. Aphra, and her group of newly hired mercenaries and bounty hunters, including Bossk, conduct their little heist on an Imperial starship. 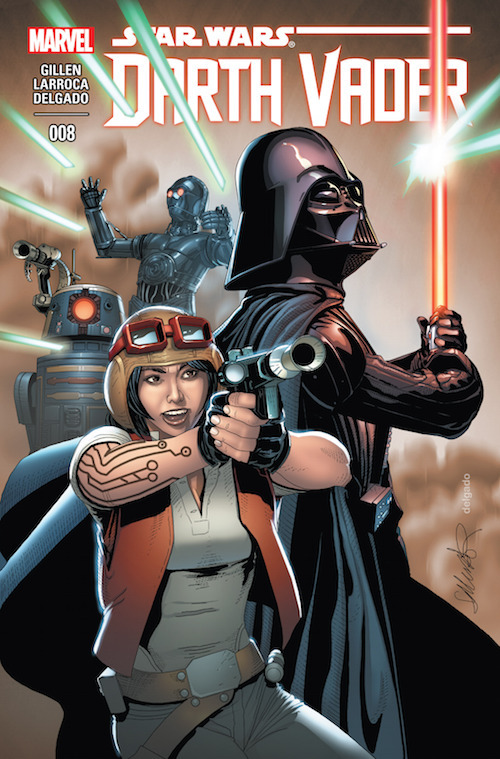 And walking away with more of the take than some of the bounty hunters realize, Aphra has stolen enough to finance Vader’s search, and his own personal droid army. 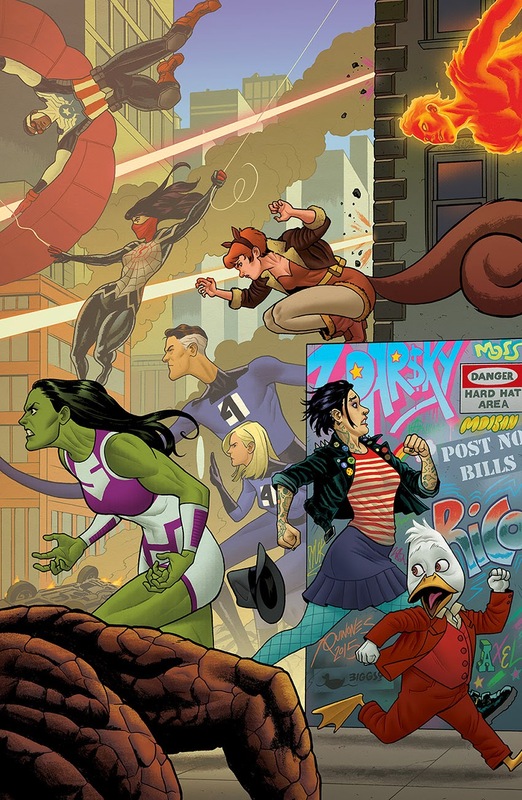 Howard the Duck (Marvel Comics) issue 5, written by Chip Zdarsky, pencils by Joe Quinones, inks by Joe and Paolo Rivera, colors by Rico Renzi and letters by Travis Lanham. The Skrull. Talos the Untamed is now in possession of the Abundant Glove plans to his darnedest to enslave the Earth. Happily, most of the local New York superheroes show up to put a stop to things… allowing Howard and his friend Tara to make run for it. But along the way, we learn Tara has powers like a Skrull, but isn’t one (a hilarious sequence), and they save the day. There’s a great running gag with issue references, and because of the whole Secret Wars thing, this is the last issue in the run, and will relaunch again in November with an all new issue 1. And I will be there. I’m loving this incarnation of Howard! 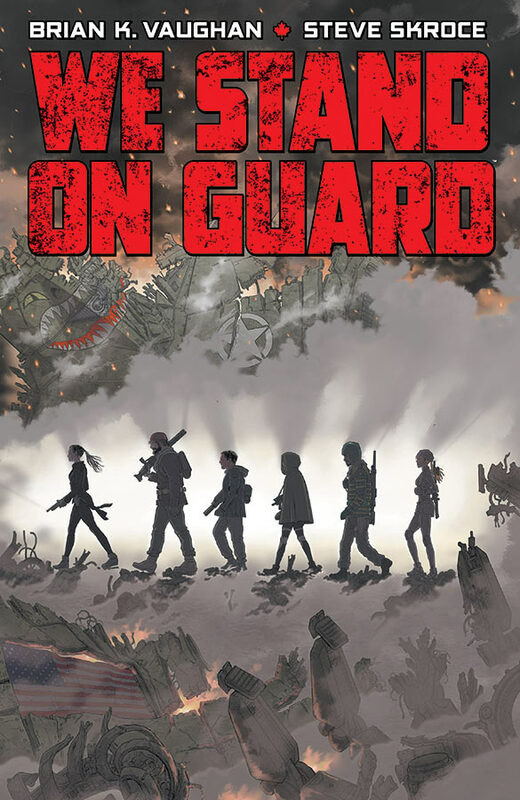 We Stand On Guard (Image comics) issue 2, written by Brian K. Vaughan, art by Steve Skroce, colors by Matt Hollingsworth and letters and design by Fonografiks. Amber, who we get a brief flashback about as the issue opens, settles in with the Two-Four while at the American forward base in Nunavut, we get a look at the American leadership and their plans. Apparently they’ve been expecting an attack like the one the Two-Four carried out in the first issue and are planning on sending in troops, not just manned bots. Great series so far, filled with in-jokes (The Littlest Robo? ), fantastic art, and a solid story. 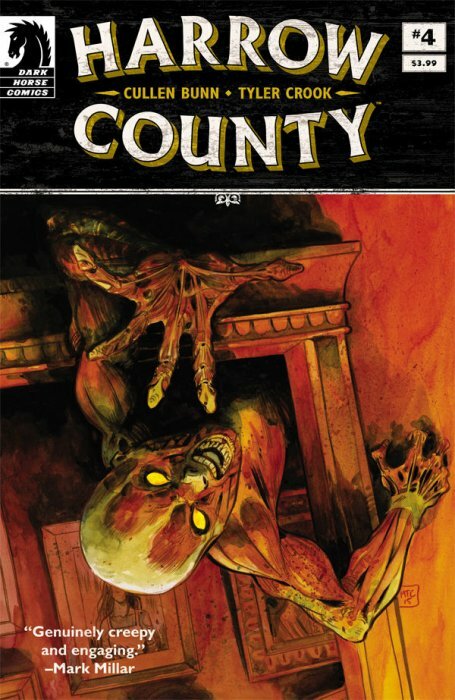 Harrow County (Dark Horse Comics) issue 4, written by Cullen Bunn and art and letters by Tyler Crook. I love this series. So wonderfully creepy, so well-written… Emmy encounters a creature that the witch, Hester Beck, created and commanded, and it has been waiting a long time for her return. He sees her in Emmy, but Emmy is far too frightened (and who can blame her after the night she’s been having) and runs deeper into the woods. But sometimes there are monsters with human faces that are more terrifying, than those in the woods. He learn more about the town, and its denizens, not all of them are human, and how Hester hopes to be awakened within Emmy. And as the night plays out, things are partially resolved, but we also get a glimpse of someone in the city, where we’re introduced to a new character, with a familiar face, Kammi. That’s it for this week, what are you reading? And remember to swing by West End Comics, say hi to Kirk, and dog, Satchel, and pick up an issue or two.